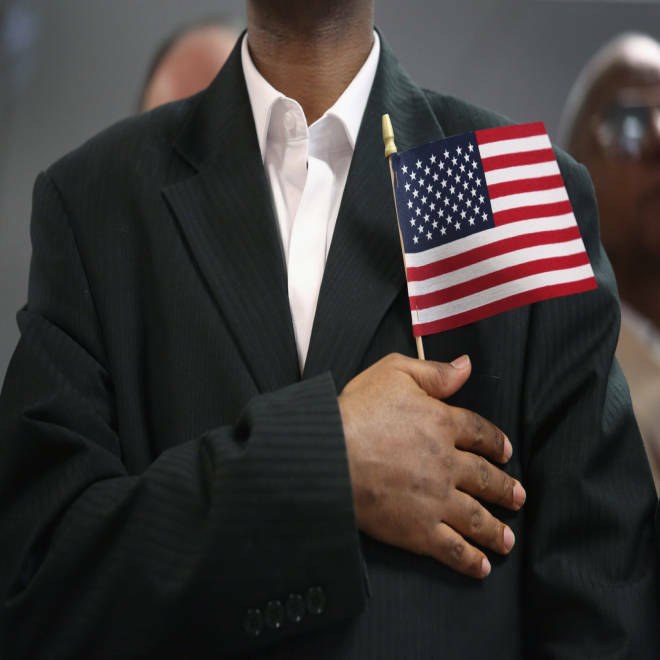 A new U.S. citizen recites the pledge of allegiance at a naturalization ceremony on May 17, 2013 in New York City. A family in suburban Boston hopes to change the phrasing of the Pledge of Allegiance to remove two words they claim violate students' rights. The family is challenging the pledge, which students recite daily in U.S. public schools, claiming the words "under God" violate the state's equal rights laws. The plaintiffs, who have requested anonymity through their lawyers, are taking an unconventional approach to challenging the pledge. Past cases argued the words “under God” violated the Constitution’s separation of church and state. Congress added “under God” to the pledge in 1954. This case, however, makes a different argument. David Niose, former president of the American Humanist Association, and the plaintiffs' representative, opened his arguments Wednesday saying the pledge’s use of “under God” violates the Equal Rights Amendment of the Massachusetts Constitution and is an issue of discrimination. Niose said the pledge’s repetitiveness in the public school system is indoctrinating and alienating to atheists. “It validates believers as good patriots and it invalidates atheists as non-believers at best and unpatriotic at worst,” he said. Eric Rassbach, deputy general counsel for the Becket Fund for Religious Liberty, intervened on behalf of a family in the Acton-Boxborough Regional School District, the defendant in the case, who would like to have their child continue reciting the pledge as it is presently written. Rassbach added that it has been illegal to force someone recite the pledge since 1943. The landmark U.S. Supreme Court case West Virginia State Board of Education v. Barnette ruled that students could not be forced to salute the American flag or say the pledge in school. It was considered a huge victory for Jehovah’s Witnesses, who cannot salute or pledge to symbols, according to their religious beliefs. Both Noise and Rassbach said a decision will likely come within six months. Since this case is an appeal, there is no testimony and the panel of seven Massachusetts Supreme Judicial Court judges will decide the case based on court briefs. Rassbach is worried that if the state Supreme Court rules in favor of the plaintiffs, the case would spur copycat lawsuits in other states with similar equal rights’ laws.